Follow Sri Lanka’s highlands railroads and jungle paths to the Horton Plains National Park on a private 9.5-hour hike from Pattipola. 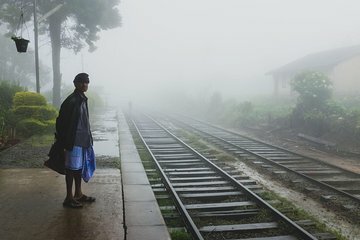 With a guide, follow the trackside path from Pattipola station and traverse Sri Lanka’s third-longest railway tunnel, entering in the dry region and exiting in the misty wet region. Then, enjoy panoramic mountain-and-valley views as you climb through jungle to the Horton Plains’ borders. Medium-difficulty trek with lunch, refreshments, and backup vehicle included. Greet your guide at Pattipola railway station and after an introduction, set off alongside the railroad. Wear comfortable shoes and bring clothes for warm, windy, or rainy conditions. At 6,240 feet (1,891 meters), Pattipola station is Sri Lanka's highest, so the tracks afford fabulous views. Take refreshment stops, and after a 1.9-mile (3-kilometer) walk, reach Tunnel 18, the island's highest and third-longest at 1,079 feet (329 meters), and its darkest for narrowing at one end. The tunnel is also unusual for bridging Sri Lanka’s dry and wet regions. The entrance enjoys comparatively dry and clear weather while the other end lies in the highlands, and is often cloaked in mist and rain. Admire the spectacular highland views at both tunnel mouths and after exiting, continue to Ohiya station. Refuel here with a picnic lunch of pasta, boiled egg, sausages and fruit before trekking on to Horton Plains National Park. Climb a steep-yet-beautiful jungle path for 1.25 miles (2 kilometers) before hiking through the lush Ohiya region, taking photos and enjoying awesome mountain and valley views on route. Your 8.6-mile (14-kilometer) hike then finishes at about 5pm at the edges of Horton Plains.